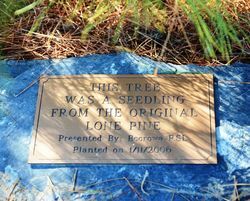 The pine tree commemorates those who served in World War One. The Lone Pine was the name given to a solitary tree on the Gallipoli Peninsula in Turkey, which marked the site of the Battle of Lone Pine in 1915 during World War One and it was the sole survivor of a group of trees that had been cut down by Turkish soldiers who had used the timber and branches to cover their trenches. 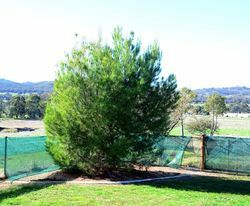 The tree was obliterated during the battle; however, pine cones that had remained attached to the cut branches over the trenches were retrieved by two Australian soldiers and brought home to Australia. Private Thomas Keith McDowell, a soldier of the 23rd Battalion brought a pine cone from the battle site back to Australia, and many years later seeds from the cone were planted by his wife's aunt Emma Gray of Grassmere, near Warrnambool, Victoria and five seedlings emerged, with four surviving. These seedlings were planted in four different locations in Victoria: Wattle Park (May 8, 1933), the Shrine of Remembrance in Melbourne (June 11, 1933), the Soldiers Memorial Hall at The Sisters near Terang (June 18, 1933) and Warrnambool Botanic Gardens (January 23, 1934). The Shrine of Remembrance's lone pine was felled in August 2012 and the timber used as part of a remembrance project, after a disease known as Diplodia pinea or blue stains fungus as it commonly called killed it. Another soldier, Lance Corporal Benjamin Smith from the 3rd Battalion, also retrieved a cone and sent it back to his mother (Mrs McMullen) in Australia, who had lost another son at the battle. Seeds from the cone were planted by Mrs McMullen in 1928, from which two seedlings were raised. One was presented to her home town of Inverell (New South Wales) and the other was forwarded to Canberra where it was planted by Prince Henry, Duke of Gloucester at the Australian War Memorial in October 1934.